Gametime Forecast: Low 50s, mostly sunny. Over the last 17 games, Michigan is 13-0 when scoring more than 16 points. 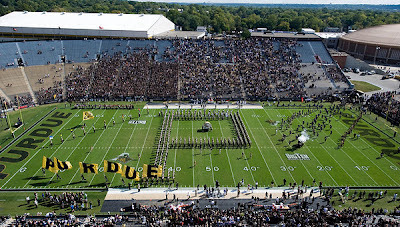 Ross-Ade Stadium. Pure Buckeye kryptonite. Maize & Brew, Touch the Banner, UMGoBlog, Big House Blog, BWS, MGoBlog. This is part of the preview where I usually break down the offense/defense/special teams. That's not going to be happening today because of my real life schedule. Instead, we're going to focus on the part of the game that matters the most to pretty much all of us, and that's the Michigan offense*. Two weeks ago Denard played one of his worst games as a Michigan Wolverine. I fully anticipate a return to what Michigan was doing in mid-2011, and that is run the ball efficiently, and let that open up the passing game. Purdue has a very competent defense. They have a strong front 7 led by defensive tackle Kawann Short, and a pretty good secondary, led by their cornerbacks. Much can be made of the fact that Purdue has played absolutely no one outside of an overrated Notre Dame team in which they got beat. So take everything I say about how good Purdue is with a hefty grain of salt. They key for Michigan is going to be the play of the offensive line. Running Fitz is going to be the emphasis tomorrow, and to have any success doing so will rest on how well Michigan's OL can block. I think they'll loosen Denard up early with some very simple passes, mostly screens and such, just to see him get back on the horse, so to speak. Once he can settle in and if the running game starts cooking, that might start setting up some downfield routes that, gasp, Michigan might actually try to do. *Assuming Michigan's defense continues their performance from Notre Dame, which might be a big assumption. • Fitz is running downhill a lot and with purpose. • We don't throw 5 interceptions in a row. • BTN shows a lot of clips of Purdue's 500-pound drum instead of Purdue highlights. • Tackling becomes an issue. • Turnovers become an issue.